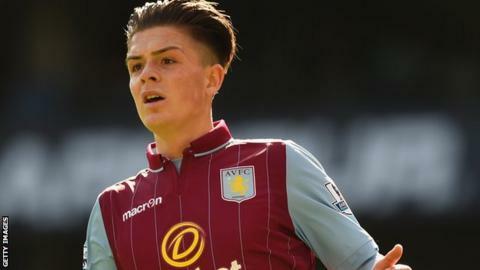 Aston Villa midfielder Jack Grealish has been warned about his off-field behaviour after he was photographed apparently taking nitrous oxide. Year-old pictures of Grealish, 19, seeming to take the legal high - known as laughing gas - from a balloon were printed in a newspaper on Thursday. "I spoke to Jack first thing this morning as he came in," said manager Tim Sherwood. "I explained to him his behaviour can't be tolerated." Similar pictures of Liverpool winger Raheem Sterling and West Brom striker Saido Berahino have also emerged in recent weeks. "We can't condone that behaviour," Sherwood said of Grealish, who has not been fined for the incident. "He is now in a responsible position as a professional footballer, he's got to make sure it won't happen again, he's assured me it won't. "But, as I said about Raheem last week, he's a young man, he was even younger a year earlier when the picture was taken." The Villa academy product has made 18 first-team appearances and was involved in both goals in their 2-1 win over Liverpool in the FA Cup semi-final on Sunday. Grealish, who qualifies to play for both England and the Republic of Ireland, is set to be included in the squad for Saturday's Premier League game with Manchester City. And Sherwood says the recent off-field attention will be a learning curve for the Birmingham-born teenager. "I'm not worried. To be honest there is only one form of discipline - that's self-discipline. That's what really matters," added the Villa boss. "Jack has to take that on board now. This is an eye-opener for him, he has to realise he has to be very careful who he can trust out there." Laughing gas, or nitrous oxide, is mostly used in medicine, commonly in surgery and dentistry for its anaesthetic effects. It has become a popular recreational drug, as it can make people feel relaxed, euphoric and giggly. Taking the gas is not illegal. A Home Office campaign last year on the risks of legal highs showed it was the second most popular drug among young adults after cannabis. In 2014, the Local Government Association issued a warning about the dangers of inhaling the gas, saying regular intake can lead to oxygen deprivation, which can result in loss of blood pressure, fainting and even heart attacks.